• Born: March 26, 1993, in Boston. • Drafted: First round, 20th overall, by the Coyotes. GLENDALE – After spending much of last season with the Arizona Coyotes, defenseman Connor Murphy said he wanted there to be no doubt that he deserved to be with the club from start to finish this season. “It was my major goal over the summer, and I knew there was opportunity,” said Murphy, the Coyotes’ first-round pick in 2011. Not only did he earn a full-time spot for the 2014-2015 season, the 21-year-old emerged as a starter. Murphy has played in all 18 games with two goals, two assists and a plus/minus rating of minus-5. The Coyotes are off to a slow start, with an 8-9-1 record through Monday, but he said he’s focused on moving forward. “You have to remember to work hard and don’t stress too much about it and have a lot of fun,” he said. Murphy was a first-round draft pick and 20th overall in 2011 and played initially with the Sarnia Sting, a junior team based in Ontario, Canada. He got his first NHL experience last season while spending the rest of his time with the Portland (Maine) Pirates of the American Hockey League. He called his 30 games with the Coyotes motivation to get a permanent place on the roster. Murphy has played on five USA men’s teams since 2009, two of which won gold medals. At 18, Murphy held leading stats as a defenseman with three goals and a plus/minus rating of 7 over six games in the 2011 International Ice Hockey Federation Under-18 World Championship. He was named player of the game when he scored the gold medal-winning overtime goal, defeating Sweden 4-3. Now with the Coyotes full-time, Murphy said he gives a lot of credit to his coaches and teammates. Murphy said his dream of playing professional hockey began when he watched his father, Gordon Murphy, play and coach in the NHL. The elder Murphy played 14 seasons in the NHL with the Philadelphia Flyers, Boston Bruins, Florida Panthers and Atlanta Thrashers and served as an assistant coach for the Columbus Blue Jackets and Florida Panthers. In a phone interview, Gordon Murphy said although it was never his plan for Connor to follow in his footsteps he’s nonetheless proud of his son’s accomplishments. Gordon Murphy said it was three things that got Connor where he is now: determination, discipline and hard work. “Right from a very young age he was very motivated and passionate, and all about the team,” he said. Connor Murphy, who wears No. 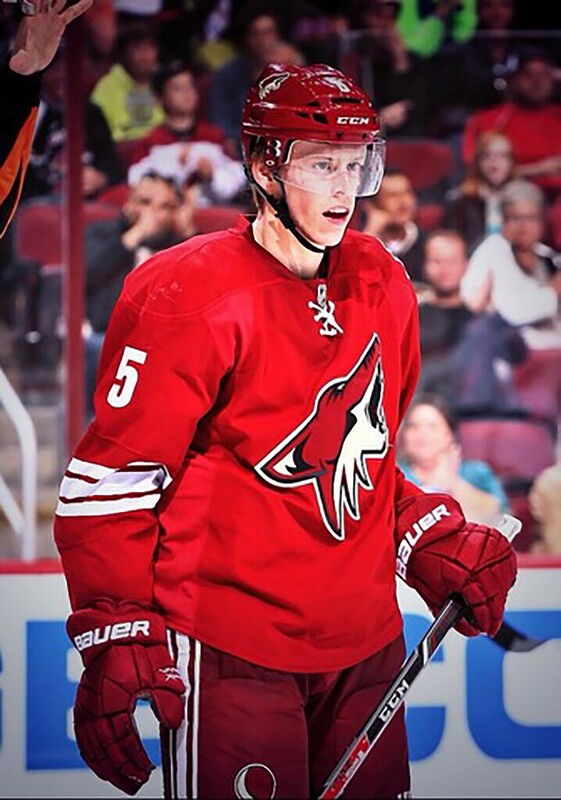 5 because it was the number his father wore, said he has earned his spot but knows he still has to work to keep it. Connor Murphy, a first-round pick in 2011, has emerged as a starter this season for the Arizona Coyotes.